Hello chefwannabe readers! Thank you for stopping by! Make sure to join the website, sign up for email notifications when I put out a new recipe and join me on all of my social media!! My new YouTube channel is much adieu about life, and some cooking videos. I will get more into the cooking video aspect as soon as I get some equipment that makes it easier! I would love to have you on any or all and make sure to visit, subscribe, follow, join, and comment! 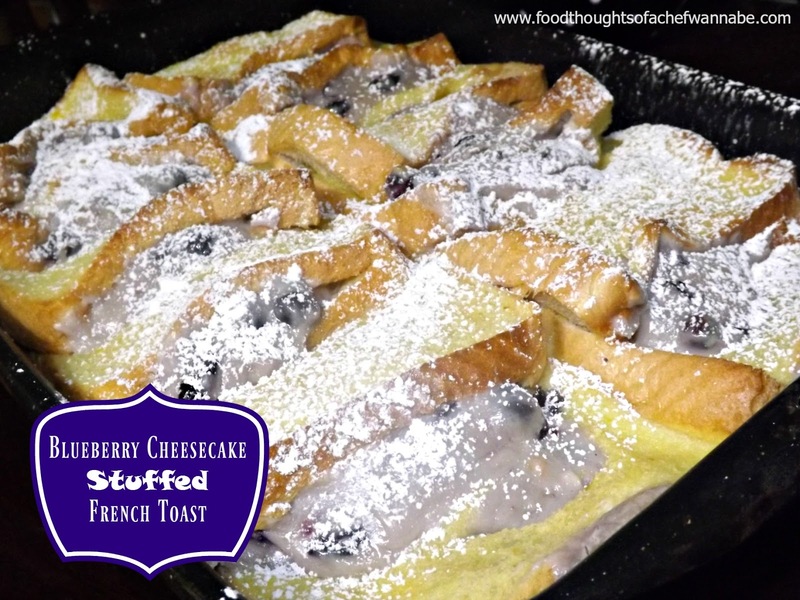 Ok, just haven't put all that info in a post lately so now, about this Blueberry Cheesecake Stuffed French Toast! YES! It IS awesome! Hubby had made a request, and much to my surprise, what I made was completely different than what he was requesting but we both decided it was so good, (as did my daughter in law) that I wanted to share it with you. This would be an awesome breakfast, brunch or even dessert dish! It is easy and can be baked, refrigerated and eaten cold or reheated! 12 (ish) slices of Texas Toast (the fresh stuff, no garlic toast, no frozen, fresh, or you can use a loaf of bread you slice very thick. Preheat your oven to 350 degrees F. Butter or grease a 9x13 baking pan. Take a knife and make a slit in the side of your bread about halfway through. It is easier if your bread is cold or even frozen! Do this to all of your slices. Put aside and prepare the cheesecake filling. Add on FILLING ingredients together and with a hand mixer, mix until combined. You can leave out a few of the blueberries to fold in whole, or just add them all in the mixture. Divide between all the slices of bread and fill up the pocket you created. Now prepare the CUSTARD. Again, combine all ingredients and beat until combined, and frothy. Pour over your pan of stuffed french toast evenly. It won't come above the bread probably. No worries, just pour over and it will be fine! Let sit just a couple of minutes and bake for 35-45 minutes. Let cook for 10 minutes! Oh, Chris, got ate just evil! I love a blueberry baked French today, but to make it a cheesecake version is pure genius. Thanks, luv!